How did WW4B get started? 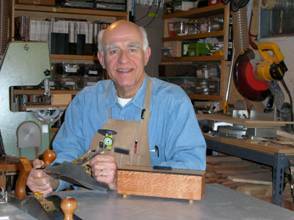 It all started with a sighted woodworker, Larry Martin. We will let him explain in his ownwords. 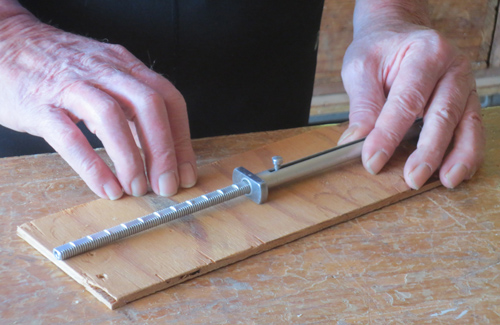 Here's the history of Woodworking for the Blind. In mid-2005 Woodcraft would run online articles from their new magazine and an article about Gordon Mitchell, a blind woodworker, caught my eye (pun intended). I loved the comment about how nervous people got because they could hear his power saw running and he was working in a dark basement without any lights on. But what really caught me was Gordon's statement about how difficult it was to learn new things and keep up with new developments in woodworking. I did a little internet search and telephoned him in Ontario to say that I would be happy to be his eyes and help him with projects. Our first project was a whirligig that I called Gordon Chopping Wood. In our discussion I was struck by the difficulty I had in conveying how the circular motion of the whirligig's propeller converted to the up and down motion of the figure chopping wood. Eventually I was able to slowly describe all of the parts involved and the Eureka moment came when Gordon said is that all there is to it? That lesson has stayed with me because I then realized how much information a sighted person gets from even a quick glance at a photo or illustration. So now I try to take my time in describing a photo to first set up the general scene and then to describe the specifics. It seems to me that this is the biggest contribution I can make. The woodworking magazines are wonderfully illustrated with photos and drawings. Many photos are there only for the purpose of an interesting layout but many more photos convey essential information so that's why I try to spend plenty of time describing each one carefully. Gordon and I went through a couple of projects over the telephone and by email and then I tried to send him additional information by scanning some articles. That was not very successful because my primitive scanner made too many mistakes with words and, of course, was often thrown by illustrations and photos. I spent a lot of time correcting these errors and I began to think that I could simply type out the entire article more rapidly than I could correct it. One day while getting help at the Mac Genius Bar a young girl suggested I record the material instead of typing it. She then gave me a quick lesson in Mac's GarageBand program, I bought a new Mac Intel computer, a microphone, some CDs and mailing envelopes, and I was off and running. Woodworking for the Blind Inc. incorporated as an Illinois not-for-profit corporation in January, 2006. I spent a lot of time researching the copyright law that has an important exception for recording copyrighted material for the blind. That's the reason why I have to limit distribution of the recordings to qualified members and why I have to verify that each member meets the statutory definition of blindness. The Postal Service's Free Matter for the Blind mailing privilege is an enormous benefit. After the computer, the big expenses are for CDs and envelopes. I watch for sales and buy a thousand CDs at a time, usually getting a package of 100 for under $15. I haven't found a sale yet for envelopes but I buy the cheapest kind I can that fit the CDs and have had pretty good luck with them. Overall only about a few dozen CDs have arrived damaged and I can replace those immediately with little trouble. Over the past few years a half dozen very generous members have sent contributions and that certainly helps carry the expenses. I try to record about an hour each night. Of course there are lots of times when I miss, but usually that lets me get 10 hours of recorded material each month as long as I make a big push at the end. I've been behind schedule all through the holiday season but hope to be back on schedule by spring. It takes me about two-plus hours of working at the microphone and computer to produce one hour of recorded material. Reading the articles is the easy part and describing the illustrations is the challenging part. It then takes another fifteen hours to burn CDs and fix-up the envelopes. I plan to continue the recording work for another couple years and then begin the process of trying to find someone else to carry on. Spike Carlsen is a woodworking author and last year published A Splintered History of Wood. The book carries the subtitle of "Belt Sander Races, Blind Woodworkers Baseball Bats." In the section headed "Woodworking Blind - Just Like Everyone Else" Spike features three of our earliest members, Gordon Mitchell, Dave Albrektson and Ron Faulkner. I enjoy Spike's quirky approach to really interesting woodworking stories. I'm now 75 years old, live about 40 miles northwest of Chicago, and have been woodworking since I retired 15 years ago. I learned how to build furniture at a local woodworking club and have attended a number of woodworking courses at Center for Furniture Craftsmanship in Rockport Maine. Primarily I build tables and small decorative boxes. I went to Notre Dame for college, followed by a Masters in History at Northwestern and a Law degree at University of Chicago. I was a lawyer for about 10 years, switched to real estate for the next 30 years. Most of my real estate work was liquidating investment real estate portfolios. There's no doubt that being retired with the chance to make furniture has been the best job I ever had. I have 9 children, 6 girls of my own and when I married Mary Jo added another 2 girls and a boy to our blended family. They've produced 25 grandchildren so far. My wife does a lot of quilting and a little oil and watercolor painting so we both stay busy. The family, of course, occupies a lot of my time.